Autumn is here, and the holidays are around the corner. The temperatures drop, and the days become shorter. Out on the vineyards, it’s time for harvest, and last year’s wine is on point. People dust off their leaf blowers and more importantly, prepare to receive their friends and family. After all, fall is all about getting together. Fall adds something to the atmosphere, something soothing. We all love to spend its calm evenings with a glass of wine on the porch, but the first cold winds are not just to enjoy some alone time, they bring people together. Today we recommend a few excellent wines perfect for having the family over. Miles Wine Cellar’s Dry Riesling is an ideal wine to start the night. It is fresh and has a lovely acidity. This crisp wine is an ideal apéritif that will stimulate your appetite gently. Green apple aromas and notes of fragrant citrus peels fill the glass and open in time. Pears are in season and are lovely appetizers to pair with this wine. Chill a bottle of dry Riesling and prepare a plate of sliced pears and brie to greet your loved ones. Amuse your guests pouring a bottle of wine with a story. Miles Wine Cellars Ghost is a light and slightly sweet white wine made with equal parts of Chardonnay and Cayuga, the local darling. The Miles family has been living in their gorgeous historic building for decades and know they have, from time to time, visitors from the other side. And as they have grown to accept their ghostly guests, they’ve decided to tell their story through wine, and Ghost was born. It’s fall, and the grill is back in the shed, but that doesn’t mean the fun is over. It’s time to delight your friends with hearty stews and baked goods. A good full-bodied wine like Mile’s Lemberger red, that is both rich and smooth, will pair well with baked dishes like a beef wellington or meaty one-pot stews. Family reunions never fall short on big announcements, so be prepared to pull the cork on that Milestone wine you’ve been saving. 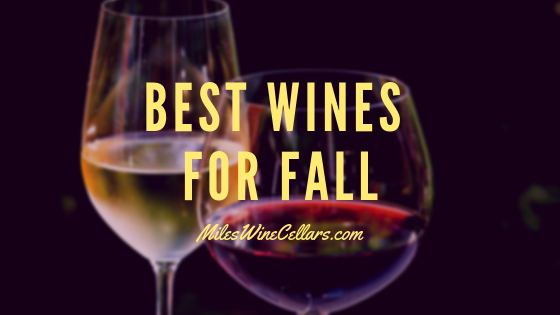 Miles Wine Cellars Milestone is a fantastic blend of estate-grown Merlot and Cabernet Franc. This wine has structure and length. Its bouquet is complex and meaningful with black fruit aromas and spices. End the night sharing a sip of Treasure with friends and family; Mills Wine Cellars fortified wine is a ruby red wine with an enticing sweetness. It displays scents of mature red berries, caramel, and hints of cinnamon. Enjoy with chocolate-covered cherries, a slice of pumpkin pie or with a contrasting local blue cheese. Fall is all about reuniting with the ones you care for. It’s about sharing your favorite food and wine. We at Miles know this and share with you a fantastic collection of wines to please every palate and make of every reunion a celebration.